Do you desire to draw near to God? Discover fresh biblical insights and renew your spirit as you journey through more than 150 new devotions for women. These gems of godly wisdom focus on God’s faithfulness and reflect on His power, presence, and promises in your life today. 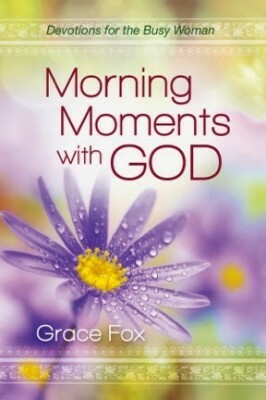 Grace Fox tuned into the heartbeat of every woman when she wrote Morning Moments with God. I recognize that Grace is an active woman who loves the Lord with all her heart, but she recognizes that many women struggle to find that quiet place to meet with the One who refuels our soul and encourages our hearts and minds. With incredible wisdom and insight into women’s lives, she lovingly guides us through Scripture and her personal stories and then nudges us back to the One who brings hope and help–our Heavenly Father. This down-to-earth devotional offers the perfect blend of wisdom and fun to lift your spirits. Walk with Grace through life’s ups and downs, focus on God’s presence, and discover him in a new way. He’s always there, ready to wrap you in peace as you draw near him with a hungry heart. In the midst of life’s busyness, these tightly packed mini-devotionals pack a good punch of truth. You’ll be refreshed.